That was it. I was then heading off to be a postgrad at the University of York, where I and my cohorts (who remain close friends to this day) would gather around a crackling transistor on Tuesday evenings to listen to, quote, re-quote and get improbably drunk over Douglas Adams’ astonishing blend of humour, insight, philosophy and his gently pointed mockery of the human race’s delusions of significance. And that pretty much both defined and encapsulated my view of life. Until then, I’d fondly imagined that I was the only one mad enough to see the world that way. Douglas crystallised that, for me and many others, creating a community of shared outlook that transcended gender, race and culture (except, of course, for the French1). Now fast-forward seventeen years. It’s May 1995 and I’m having lunch in the kitchen of a rather beautiful house in Islington where, across the table from me, illustratively moving the condiments around – “…if this plate is the internet and this pepper pot my computer and this fork…” – is The Man Himself, Douglas Adams. With us is a friendly and thoughtful TV producer, Robbie Stamp, and my friend Fearghas, a fellow doyen of the early public internet. Fearghas had asked me along to pontificate about online currencies and e-cash with some blokes who were thinking about doing an internet startup. My first reaction was, “Here’s my day rate”, to which Fearghas retorted, “It’s Douglas Adams…”, to which the only possible response was, “I’LL BE THERE!”. So I was. A couple of weeks and more meetings later and I’d been offered the job of CTO of his new company, The Digital Village, an offer which occasioned some gratuitous Morecambe and Wise-style heel-clicking in the genteel environs of London’s Bedford Square. And the rest is most definitely history. We did some great work, doing stuff that was, both philosophically and technically, decades ahead of its time (and there’s a lesson there in the art of the possible rather than that of the conceivable). We ultimately though had to shutter the company in 2001 after being caught in the cross-fire of the dotcom implosion. As a company, our still-visible legacy is in two products and a lot of forward thinking. Starship Titanic (Codie award for Best Adventure Game of 1999) is now enjoying a well-deserved and well-regarded new lease of life on the Steam platform and our online community, h2g2.com. h2g2 – The Hitchhiker’s Guide made real – is now, after languishing for years under the heavy-handed moderation of the BBC, an independent, community-owed entity. The forward-thinking bit is covered by the blanket title of ‘stuff that helps humans and machines collaborate’, covering anything from distributed architectures through to data visualisation and social design models that regard humans and machine systems as indivisible parts of an overall cybernetic system. And our fantastic team from those days has gone on to achieve great things in an eclectic range of disciplines that I think would have made Douglas proud: VFX, games, AI, VR, AR, theatre, writing, organisational research, 3D worlds, television, social media, and indeed pretty much any combination of these. But forward thinking doesn’t always get picked up by a world more focussed on immediate gratification: the irony here is that, in creating the architecture and process of h2g2, we’d very actively considered the issues of self-moderation, editorial selection and the damping out of fake and irrelevant content, creating a model where those became largely non-issues, even in a fast-scaling service. So we look at Facebook and its ilk today and wonder just how the hell they could have been short-sighted enough not to design in truth and integrity from the beginning. But that’s how it goes. 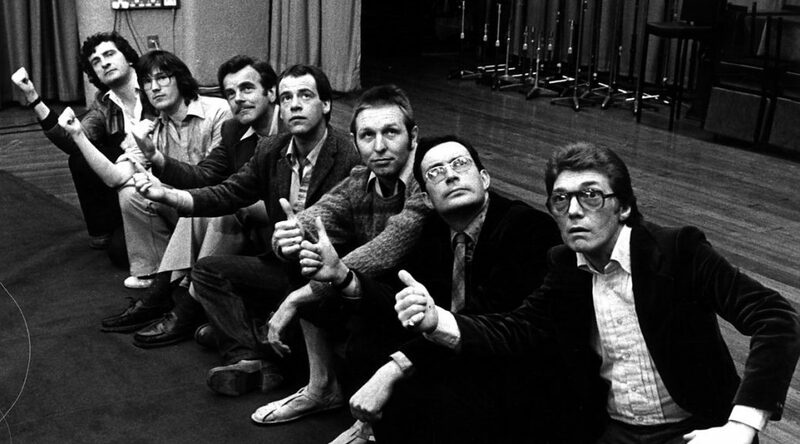 Header image of the original cast (and Douglas) from the BBC. * Douglas regularly described himself as a “Best selling author in Britain and Germany and a worst-selling author in France”.